Located only two hours away from Sydney’s busy central business district, the Blue Mountains are one of the city’s favourite spots to relax and recuperate, surrounded by some of Australia’s most dramatically beautiful wilderness areas. For well over a century this rugged part of the Great Dividing Range has been a mecca for visitors due to its scenic vistas, abundant wildlife and numerous hiking trails. During the winter months the Blue Mountains sometimes also provide visitors with a glimpse of snow – the closest region to Sydney to do so. Due to the mountain’s long-standing appeal, accommodation options in the area are many and varied, ranging from rambling Victorian-era guesthouses to budget options such as camping grounds and backpacker hostels. As someone who generally travels on a shoe-string budget, one of my favourite places to stay when visiting the Blue Mountains is the Blue Mountains YHA, situated in picturesque Katoomba and part of the worldwide Youth Hostel Association network. Katoomba YHA is located in a lovely old Art Deco building, centrally situated on Katoomba Street, which leads to the popular Echo Point lookout, popular attractions such as Scenic World, and numerous hiking trails - ranging from leisurely half-hour strolls to walks that take several days to complete. It’s also just minutes away from Katoomba’s shopping precinct, with its trendy boutiques, galleries, antique emporiums and cosy retro cafes. Constructed in the early twentieth century, the building originally served as the Wentworth Cabaret Club and guesthouse, and was a popular venue for balls, dances and other social events – especially in its heyday during the 1930s. 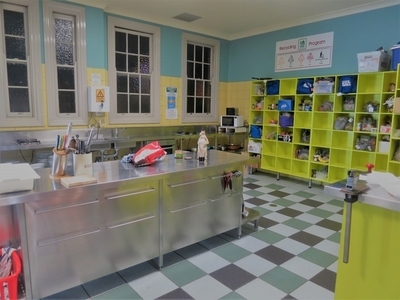 After being utilised as a Bible college for a few decades, the YHA took it over in 2000, refurbishing the grand old building it into the attractive visitor accommodation that we can enjoy today. As a building that was originally constructed to be a guesthouse, the hostel offers a wide range of visitor accommodation, sleeping a total of two hundred guests. As well as single-gender dormitory-style accommodation for men and women (available in rooms with four, five, six or eight beds), there are also mixed dorms. Although these are ideal for backpackers and other independent travellers, they’re also great for group bookings – for example, school excursions or hiking groups. For visitors who prefer more privacy, the hostel also offers a good range of single, twin, double and family rooms – each with its own small desk, a heater (essential during the chilly winter months) and some simple shelves. Some of the private rooms also feature private bathrooms. The lovely old building still retains many of its character features and these are especially apparent in its common areas, where guests can admire some beautiful lead-lighting and wood joinery. 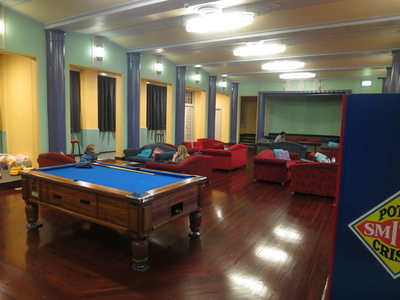 In particular, the former ballroom (complete with ‘sprung’ wooden floors) and stage area, where once upon a time the band would have played, now serve as the hostel’s lounge area, and today visitors can relax, eat or read there in comfortable sofas – or play pool. Close by is a large, clean and well-equipped common kitchen, spacious dining area, reading room and cosy television lounge. For those who want to enjoy the fresh mountain air, there are also a few small tables scattered around a lovely little outdoor terrace at the back of the hostel. The hostel features plenty of toilet and shower facilities, as well as a laundry, fitted with modern coin-serviced machines and dryers. 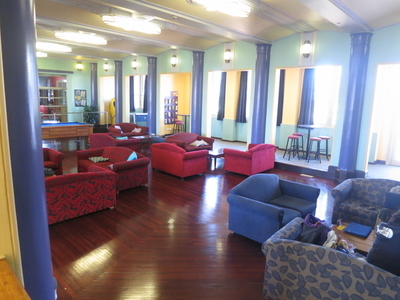 For first-time visitors, the foyer area of the hostel is not only beautiful (with its sturdy wooden staircase and other interesting architectural and decorative features) but also very practical, and offers first-class tourist advice, a wide choice of local tours, and plenty of information about the many local walking tracks and other attractions. The Blue Mountains offer not only unspoilt natural beauty, but also plenty of attractions for art-lovers, history enthusiasts, adrenaline junkies, shoppers and active families. There really is something for visitors of all ages and inclinations, and the knowledgeable staff members at the hostel are always ready and able to offer advice, helping you to make the most of your stay. 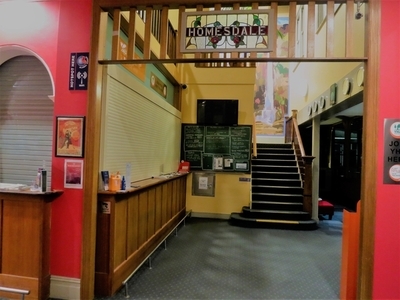 In a nutshell, if you’re looking for comfortable and cosy budget accommodation in the heart of Katoomba, you really can’t go past this wonderful, character-laden hostel. To find out more and to book direct, visit this page on the Australian Youth Hostel Association website. 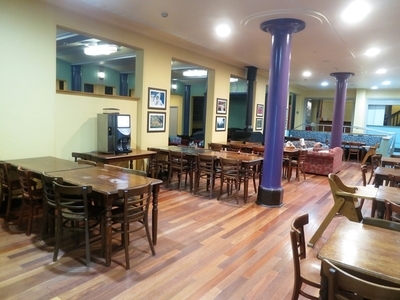 For more information you can also call the hostel directly on 02 4782 1416 or email them at bluemountains@yha.com.au. Despite their name, youth hostels welcome visitors of all ages, so whether you’re a young independent traveller, a serious bushwalker, an active family or retiree couple on a weekend escape, this place has something for everyone. 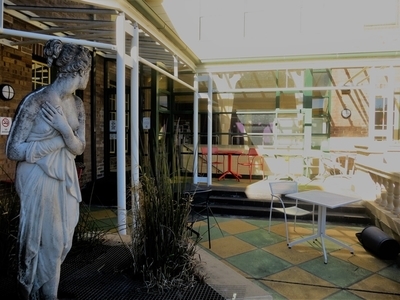 Blue Mountains YHA is located at 207 Katoomba Street, an easy ten minute walk from the town’s railway station. London's best raw food cafe or restaurant?